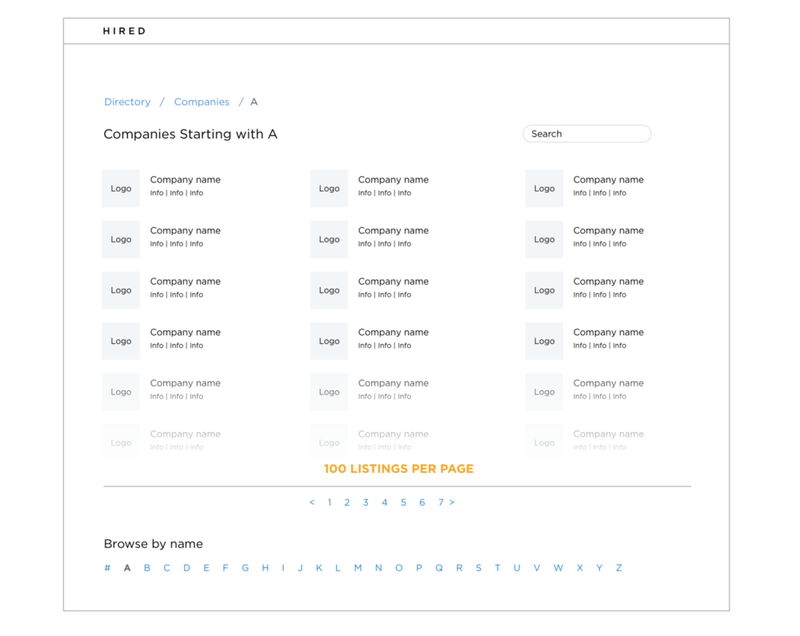 As the product design for the acquisition team at Hired, one of our main focuses was to help increase organic traffic by investing in SEO. Our approach was to create structured content on the website in the form of directories. 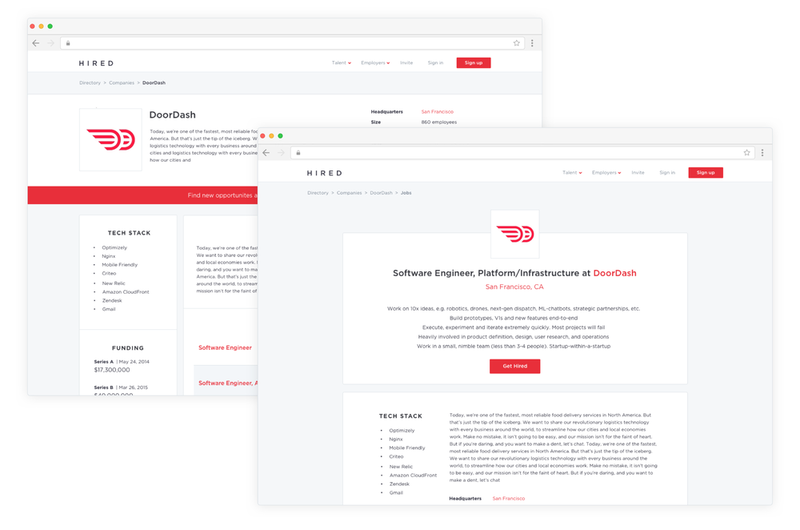 We wanted to create crawlable pages that would rank well in search engines while providing valuable and unique job search information for users. Conducting generative research with my product manager to to pin point user needs. Constructing a site architecture map and low-fidelity wireframes to create visibility across team members and stakeholders. Syncing frequently with engineers during development to assure the quaality and functionality of the designs before launch. We previously had outdated and inefficient directory pages buried within the site. There was not enough useful content or links to help these pages rank well. The lack of internal links or site architecture meant they were essentially uncrawlable. How can we create a directory that was intuitive and informative to users, yet structured well enough to spread ranking power across each node? We began by gathering qualitative data through interview sessions with software engineers, data scientists, product managers, and UX designers who were actively on the job search. We wanted to understand what kind of information users gathered during their job search and what kind of content they gravitated towards on competitor sites. Users want to see social proof to prove the company's credibility: user generated content like reviews and ratings were especially powerful. Objective data is key. Users love seeing data visualizations, but the data must be objective. It helps to know how this data was collected as well. Some measure of work/life balance is very important. The first step was to establish a clear and simple site architecture of internal links. This allows rank power to flow through every branch of the site, increasing the ranking potential of each page. My main objective was to create visibility amongst everyone on my team and full understanding of how the pages interacted with each other. This also helped me to keep track of the amount of content in each node. I then built low-fidelity wireframes to give the engineering team an idea of the component based template I wanted to use for all the pages. This allowed them to get a head start in laying the foundation of the pages. We worked with a third part data scraping service as well as an SEO consultant to get our first data ingestion to fill the content. After launching our two directories, we were able to double the amount of traffic from organic search with a bounce rate that was lower than expected. Our next steps are to expand on the directories and create more content that will urge users to sign up. As engineers are cleaning up bugs from our first launch, my PM and I began discovery and research for a salary and skills directory. We are also brainstorming different types of user generated content based on our early research to ensure that our content quality is constantly improving and that we can offer valuable information to those on the job search.